Are Airlines Spying On You Through Inflight Entertainment? This is a topic I see raised every so often, and I think it’s worth addressing, especially given that people generally have more privacy concerns than ever before. 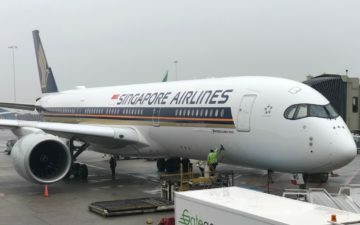 One person took to Twitter this weekend to note that there was a camera underneath the personal inflight entertainment system on his Singapore Airlines flight, and asked in what capacity the airline was using these. Singapore Airlines’ inflight entertainment systems developed by Panasonic and Thales feature these, and these can be found on many of their A350s, A380s, 777s, and 787s. Several airlines have these cameras, and as far as I know all airlines with them have deactivated the feature. It does make me wonder why they bother installing these, given that no airlines have plans on using them, and also given that they create privacy concerns. There are some features where there’s no harm in having them even if they’re not used, but this is one of those features that will make some people uncomfortable. Was there at some point a plan to actually use these in some way? Presumably not to “spy” on people, but rather for some sort of video calling or something? Now, to be clear, there are some airlines that have cameras in their cabins. 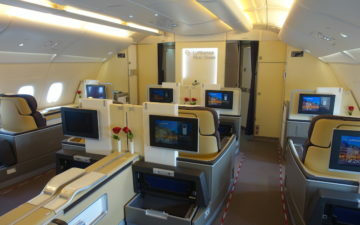 For example, on the A380, Emirates has cameras at the back of their cabins. In the below picture of the A380 first class cabin you’ll see that behind the last two seats in the center there’s a little black cutout in the bulkhead, and that’s a camera. I wouldn’t say that’s intended to “spy” on passengers, but rather it’s a smart feature for a plane this big, that allows the pilots and purser to keep an eye on what’s going on in the cabin (in the event of an emergency, etc.). This actually seems to me like a legitimate safety feature. Similarly, I believe JetBlue has cameras in their cabins, so the pilots can keep an eye on what’s going on. Do seatback cameras make you uncomfortable, even if they’re supposedly deactivated? Does anyone actually know with what feature in mind these were installed to begin with? If they want to see me pick my nose and play with myself, be my guest, always been a big fan of exhibitionism. Airlines will often install technology that may be useful in the future even if they don’t have a use for it at the moment. If, for whatever reason, video-chatting became as popular as texting and airlines decided they wanted to enable that functionality onboard then for SIA it’s as simple as enabling the cameras and downloading some technology as opposed to retrofitting the entire aircraft just to fit a camera at every seat. I was reading somewhere than a full service airline recently installed credit card readers in every seat even though they said that there was nothing that could be purchased onboard, rather, they chose to include the credit card chip reader so they could ‘respond to future market trends’. This might seem excessive precaustions but I think it’s perfectly justifiable. Also, I think a couple of airlines have the ability (or at least talked about the possibility) of being able to video-chat from seat to seat onboard an aircraft. I think airlines are really just covering themselves for all kinda of technological evolutions that might happen which will mean that they won’t have to replace their IFE for 10+ years. I wouldn’t be surprised if airlines are spying on you through IFE systems. Thales is a big defence contractor for the British Military (they do ATC systems and metros as well but they also do UAVs and aircraft carrier systems) and I have noticed cameras in emirates before. I think they’re most likely there for safety reasons though or perhaps for the flight attendant call buttons. Some carriers use cameras to enable the crew to see the passengers for Take-off / landing. Cabin crew have to be able to see a certain percentage of passengers while they are in their jump seats and without cameras in the suites this wouldn’t be possible with some of the more private F & J seats out there. Credit card readers would be SIA as well, I believe. @ Richard — Respectfully I don’t think that’s accurate. There’s not a single airline I know of that turns on cameras at individual seats during takeoff and landing. Remember that some of these IFE systems use relatively off-the-shelf android-based components, so it is probably more cost effective to just install what is basically a standard consumer tablet (with a camera) with the airline’s own operating system installed (with camera function disabled), rather than commission and build a more bespoke IFE system. A3580??? I’d love to fly that plane. Lucky what generation airbus plane is that or is it me still stuck in 2019? I think you meant A380s right ? Singapore Airlines’ inflight entertainment systems developed by Panasonic and Thales feature these, and these can be found on many of their A350s, A3580s, 777s, and 787s. Nah, not bothersome. It’s not like they have some secret, MASSIVE hard drive equipped on these aircraft to store hours worth of video of dozens to hundreds of individual passengers. I would worry about smart devices camera and microphone much more. My first thought was ad targeting based on your perceived demographic, mood, state of consciousness, etc. Many digital billboards use camera technology to those ends now. Korean Air also has cameras in the front of their F cabins (at least) on their 777s as well. Maybe it’s not a bad idea with the rise of in-flight sexual assaults? Daftboy is correct. Also, if FAA wants people to put phones in airplane mode before takeoff because of electronics interference, do you think they would allow airlines to use cameras at the same time? Not likely. Those cameras are already included on that generation’s IFEC hardware offering. It is up to each customer (airlines) to see if they want add the functionality in the software. Source: worked on them. @daftboy – correct, a lot of these are simply off-the-shelf tablet touchscreen displays, sourced from common manufacturers, integrated into a seatback unit by a company like Thales. Whether or not they include the actual tablet processors and firmware, virtually all touchscreen displays manufactured these days include small cameras in the bezels. I doubt there’s any actual plans or intent for these cameras to actually be used beyond that. Perhaps the software is tracking how long someone is viewing the entertainment content or capturing how long someone stays in their seat, sleeps, etc. This data also can go into a bigger database tracking people’s movements. The airline might not be using the cameras at all. It is probably something Thales is using for its own purposes. Perhaps they gave the airlines a discount on the hardware to allow them to install. On etihad ive never seen where the exact camera is but walked into FA area and saw on their screen a view of all F passenger suites. I assume its to see if anyone needs anything but they are watching you..
Like any other device that has a camera….laptop, TV, seat back monitor….just put a “post-it” over it if it bothers you…problem solved! We have cameras on buses and trains in the UK. What on earth is the fuss about having them on planes too?